It's only 796 characters. We strongly recommend writing at least 1.000 characters. Use content that makes your app unique (features description, characteristics, how to use your app, ...). Your description needs to convince people to download your app. Also, be sure to add important and relevant keywords in your description to improve your iTunes app page and optimize your SEO. Your app's last version was released on December 01, 2015. It is important to regularly update your app. Best practices recommend to update your app every 4 to 6 weeks. This means fixing reported bugs, improving existing features, launching new features etc. Keep an eye on users' feedback. The next great features may already be asked by many users. 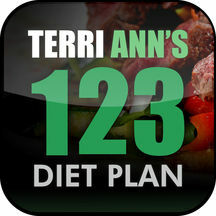 This app is a supplement to the Terri-Ann 123 Diet Plan with additional recipes, meal examples, fitness plans and more. It also has a photo share area for sharing your progress and inspiration. Terri Ann's 123 Diet Plan is the plan everyone's talking about.. With my plan you could lose up to 10lbs in 10 days then a healthy 2lb or more every week. The 123 Plan is the diet for anyone who has tried them all. It breaks the weight loss system into three simple stages and is proven to work. With over 25,000 members (Mar 2014), The Terri Ann 123 Diet Plan has helped 1000's of people lose weight and keep it off. Not a member? visit www.terriann123dietplan.co.uk to find out more. Or download the app and click on 'Join Us'.